A 99-year-old man from Kent has said he still works a five-day week because he loves his job. 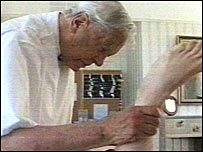 John Wernham, from Maidstone, has been an osteopath for 70 years and practises at a college he founded in 1953. He said: "I'm happiest when I'm working - what's the difference between work and pleasure?" Mr Wernham said he would continue to try to heal as many people as he can and would only retire when his health forced him to. "I've been doing it for 70 years - why stop? And I'm teaching others to carry on." Osteopaths diagnose and treat problems with muscles, ligaments, nerves and joints to help the body to heal naturally without the use of drugs or surgery. Treatment involves manual techniques used to ease pain, reduce swelling and improve mobility.